When you think about a fresh, flaky croissant, you probably conjure up images of Paris. A lazy morning on the Left Bank, a small round table, reading Le Journal with a steamy cup of café au lait, and of course, that croissant. That warm, buttery croissant. Crispy on the outside, light and fluffy on the inside. Enjoyable on all sides and in every way imaginable. Now, ask yourself where it’s from. Go deep. Go beyond the simple answer of “the little bakery around the corner” and search for the origin, the true birthplace of that oh-so-famous French delicacy. We’re sorry to do this to you, but we’re going to get right to it. That croissant you’re enjoying as you lovingly stare at the Tour Eiffel? It’s not French. Let’s start with the linguistics. Croissants are a style of viennoiserie pastries, which of course relates back to the Austrian city of Vienna, otherwise known as the birthplace of croissants. The ancestor to the modern-day croissant was called the kipferl, which dates back to the 13th century and comes in various shapes and sizes. They are often filled with nuts or other fillings, and kipferl (which have possible but unconfirmed roots in ancient Egypt), are also considered to be a form of rugelach, a Jewish pastry of Ashkenazic origin. They are denser and sweeter to what we think of as the modern croissant. Around the turn of the 17th century, that dough began to change, and the style of dough used in traditional croissants was first documented. How it morphed into the traditional croissant, though, is still a part of culinary lore. Legend has it, Viennese bakers working throughout the night heard the Turks as they tried to tunnel beneath the city during a 1683 invasion. They alerted the city’s defenders, in essence saving it from the Ottoman siege. In celebration, the bakers created a pastry that would symbolize the crescent moon, which is also the prominent symbol on the Turkish flag. The German word kipferl, or crescent, became a culinary re-enactment of Vienna’s victory over the Turks. The first verified evidence of the croissant in France is due to a baker named August Zang. Zang had an upscale patisserie in Paris in the early 1800s, named the Boulangerie Viennoise after his native Vienna and serving many of their famous treats — including kipferl. His Parisian version, though, was made flakier than the traditional sweets, and Parisians began calling them croissants because of their crescent shapes. Finally, in 1915, a French baker named Sylvain Claudius Goy would write the recipe that we all know and love today, especially as we sit with a warm cup of Joe in the morning. Whether you’re a home chef making an authentic French breakfast on the weekend or you’re a Washington, D.C. bakery needing to upgrade your equipment, Alto-Hartley has a full range of baking equipment and supplies. 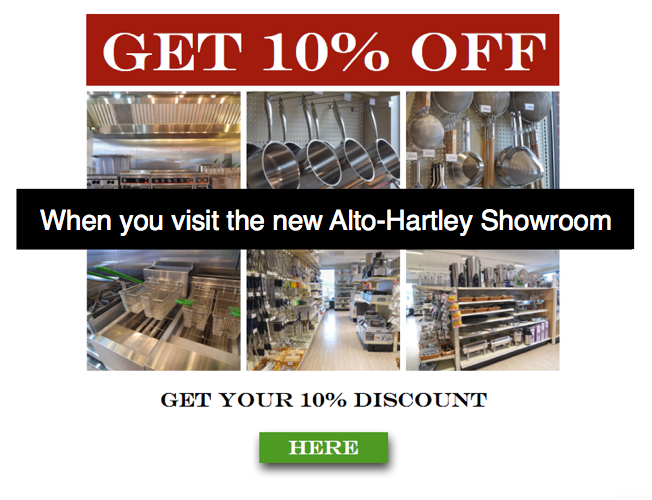 From sheet pans to spiral mixers, stop by with the coupon below, and receive 10 percent off your next purchase.